The Huawei P30 has been announced, and it’s the latest attempt by Huawei to take the Western smartphone market by storm – but is it good enough to take on the top offerings from Samsung and Apple? Samsung recently launched the Samsung Galaxy S10, and Apple’s iPhone XS is still fairly new, and both have top-of-the-line specs and features – so they’ll prove tough competition for Huawei’s new contender. But which of the three flagships is the best for you? To help you decide we’ve compared the phones so you can see the strengths and weaknesses of each. The Samsung Galaxy S10, Huawei P30 and iPhone XS are made with a glass front and back and a metal frame – they feel like premium devices, with not a shred of plastic in sight. The Samsung Galaxy S10 is slightly bigger at 149.9 x 70.4 x 7.8mm as opposed to the iPhone XS at 143.6 x 70.9 x 7.7mm, but the iPhone is actually 20g heavier at 177g. Between them is the Huawei P30 at 149.1 x 71.4 x 7.6mm and 165g – there's not a huge difference in size between the phones. The Samsung Galaxy S10 Plus and iPhone XS have the same level of protection with IP68, which means they’re protected from dust and waterproof up to a depth of 1m – that’s the highest rating you can get in a smartphone, and it means they’ll all suit your needs. The Huawei P30 is a little less protected with IP53, which protects it from sprays of water and stops dust in the internals breaking the phone, but it’s definitely not as sturdy as its competitors. The iPhone XS has a slightly smaller screen than the Samsung Galaxy S10, as the Galaxy has a 6.1-inch display as opposed to the iPhone’s 5.8 inches, though both lose some of that real estate, with the punch-hole camera cut into the former’s display and the teardrop notch dropping down from the top of the latter’s. The Huawei P30 has a little in common with both, as it has a 6.1-inch display like the Galaxy S10 but a teardrop notch like the iPhone XS. Its resolution is 2340 x 1080, a little weaker than the iPhone XS at 2436 x 1125 or Samsung Galaxy S10 with 3040 x 1440. Both the Huawei P30 and iPhone XS use OLED screens, so they’re high quality, but Samsung uses its own AMOLED tech in the Galaxy S10 screen, and it has HDR10+ too to create a better dynamic range in colors and brightness. 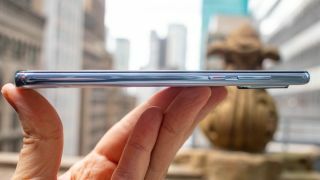 The display on the Galaxy S10 is also curved, as opposed to being flat on the iPhone XS and Huawei P30, which could affect your viewing pleasure for better or worse depending on how you like it, but we didn’t feel it made much of a difference. The iPhone XS has a battery that’s on the small end of the scale at 2,658mAh, it’s the smallest of the three phones, but we found it would last the day anyway. It does look small in comparison to the Samsung Galaxy S10’s 3,400mAh power pack – although when we subjected them to the same battery test, they lost the exact same amount of charge. The Huawei P30 is a step up again at 3,650mAh, which is comfortably big for a phone battery – we’ll need to test it fully when we get our hands on the phone, but it will likely last at least a day of heavy use. Charging is just as important as battery capacity, but in that regard the battery heavyweight Huawei P30 misses a trick, as it’s the only device of the trio that doesn’t support wireless charging. Since most phones nowadays do that’s quite a surprise, especially given that the Huawei P30 Pro does support it. The iPhone XS has a dual-lens camera, consisting of a 12MP f/2.4 telephoto lens and a 12MP f/1.8 wide-angle lens, both of which have optical image stabilization (OIS), so it can take detailed close-up pictures as well as great wide shots. When we tested the camera out we found it also took high-quality low-light pictures thanks to better light sensitivity than previous iPhones, and it created rich color tones in different settings. The Samsung Galaxy S10 steps up from the iPhone XS in terms of camera number, as it has three on the back – a 12MP f/2.4 telephoto lens with OIS similar to the iPhone XS, and also a 12MP variable aperture lens which switches between f/1.5 and f/2.4, as well as a 16MP f/2.2 ultra-wide lens. Bigger doesn’t necessarily mean better, so the Galaxy S10’s three camera setup doesn’t necessarily trump the iPhone XS with two, but we found the ultra-wide lens great for taking wider pictures and the phone’s scene optimizer ability great for taking pictures in a variety of settings. The Huawei P30 matches the S10’s three-camera setup, though the specs and roles of the lenses differ – there’s a 40MP f/1.6 SuperSpectrum camera, a 20MP f/2.2 ultra-wide one and an 8MP f/3.4 ‘periscope’ lens. The two selling points of the P30’s camera is that its SuperSpectrum snapper picks up RYYB instead of RGB light, to pick up more color in a shot, and the periscope lens can take pictures with up to 10x optical zoom. In our quick test we found this worked well, picking up details when zoomed that aren't noticeable in a wide shot. On the front, the iPhone XS has a 7MP selfie cam while the Galaxy S10 beats that at 10MP – but both are blown out of the water by the Huawei P30’s 32MP snapper, which will take selfies at a resolution you’ll probably never need. One of the biggest differences between the phones is that the iPhone XS runs iOS 12, while both the Huawei P30 and Samsung Galaxy S10 run Android 9 Pie – for some, having one of those operating systems is a sure sell. Operating system isn’t everything though, and processing power is important too. The Samsung Galaxy S10 runs on a Snapdragon 855 in the US and an Exynos 9820 elsewhere, while the Huawei P30 uses a Kirin 980 and the iPhone XS uses Apple’s own A12 Bionic. The phones have varying amounts of RAM too – the iPhone XS only has 4GB, but that increases for the P30 at 6GB and Samsung Galaxy S10 at 8GB. One difference between the phones is that the iPhone XS unlocks using Face ID, but the Samsung Galaxy S10 and Huawei P30 use in-screen fingerprint scanners – if you have a preference, this may help you decide which phone you prefer. The Samsung Galaxy S10 and iPhone XS are both high-end devices – if you want a Galaxy S10 you’re looking at paying $899 / £799 / AU$1,349 for a 128GB phone and $1,149 / £999 / AU$1,699 for a 512GB model. That’s slightly cheaper than the iPhone XS, which will cost you $999 / £999 / AU$1,629 if you want a smaller capacity 64GB model, rising to $1,149 / £1,149 / AU$1,879 if you want 256GB and $1,349 / £1,349 / AU$2,199 for 512GB. But for the real affordable device of the trio you’re looking at the Huawei P30, at £699 (roughly $790, AU$1,100), for its 128GB – which is an interesting price point given the larger P30 Pro is priced the same as the Galaxy S10 Plus. That means for a handset with identical storage, the iPhone XS will cost you $200 / £350 / AU$500 more than the Samsung Galaxy S10, and the Huawei P30 is £100 (roughly $130, AU$185) more than the Galaxy S10 for the 128GB storage – but it's a little hard to compare since the three phones have no size in common. . Of course there are more features to a smartphone than storage, but that’s a big step up. It’s hard to call one of the three phones ‘best’, especially as different people want phones for different purposes, but the new Huawei P30 is a strong contender, bringing a great battery, competent camera setup and premium feel at a relatively low price. That said, the Samsung Galaxy S10 has one of the best displays you can get in a smartphone right now, and its cameras are likely just as versatile as the P30’s. The iPhone XS is a popular choice too, and many people swear by the iOS 12 operating system it runs, as well as its sleek design. So if you’re looking to buy a new flagship phone it’s up to you to decide your budget, and what features are important to you on your new handset.